Are you ready for more Tales from the Tour Bus? Today, Cinemax announced they’ve renewed the TV show for a second season. 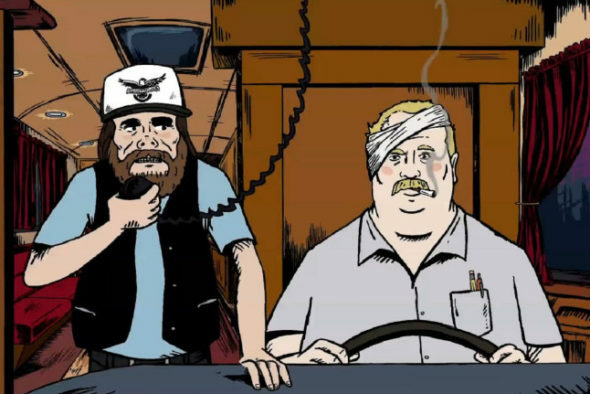 MIKE JUDGE PRESENTS: TALES FROM THE TOUR BUS, chronicling the exploits of legendary music artists, will return for a second season later this year, it was announced today by Kary Antholis, president, HBO Mini-series and CINEMAX Programming. While the first season of the show spotlighted country musicians, the new season will focus on funk music greats, including James Brown, George Clinton and Bootsy Collins. TALES FROM THE TOUR BUS features animated interviews with former bandmates, friends and other erstwhile associates, who share uncensored anecdotes about these artists, brought to life by animated reenactments, and woven together with live-action archival performance footage and photos. Debuting on CINEMAX in Sept. 2017, the first season of TALES FROM THE TOUR BUS spotlighted notorious country music legends, including Johnny Paycheck, Jerry Lee Lewis, George Jones and Tammy Wynette, Billy Joe Shaver, Waylon Jennings and Blaze Foley. Rock and Roll Hall of Famer and Parliament-Funkadelic founder George Clinton will serve as consulting producer. Returning for season two are executive producers Glen Zipper and Sean Stuart; joining the show are writer Mark Monroe as co-executive producer and screenwriter-producer and veteran music journalist Nelson George (“Finding The Funk,” HBO’s “Life Support”) as consulting producer. What do you think? Have you seen Tales from the Tour Bus? Will you watch season two? More about: Cinemax TV shows: canceled or renewed?, Mike Judge Presents: Tales From the Tour Bus, Mike Judge Presents: Tales From the Tour Bus: canceled or renewed?